DrugFreeAZKids.org is a program of Southwest Behavioral & Health Services that has been endorsed by the Arizona Association of Chiefs of Police for outstanding work in prevention. We inspire people to feel better and reach their potential. Through helping people discover their strengths, we improve our communities. Our mission is to prevent and reduce youth drug and alcohol use through community education and awareness by providing parents, caregivers, healthcare providers, educators and others with educational tools, information and resources. This project is supported by The Governor’s Office of Youth, Faith and Family (GOYFF) and the Arizona Parents Commission on Drug Education and Prevention. For more information, visit www.DrugFreeAZKids.org. South Mountain W.O.R.K.S. Coalition, funded by a Drug Free Communities grant from SAMHSA, seeks to reduce youth drug and alcohol use in the South Mountain community of Phoenix, Arizona. The coalition’s mission is to educate, equip and empower community members to create a healthy and drug free future for children, youth and families. Community Education Presentations, workshops and seminars regarding underage drinking and drug use (i.e. social access, perception of harm, consequences, prevention and treatment resources) offered to the community free of charge. Public Information and Social Marketing (PISM) Alcohol and drug related information, resources and media materials disseminated to the community through health fairs, electronic and print media, and public service announcements. Youth Leadership/Council Youth in South Mountain participate in workshops and meetings designed to empower youth with skills to become leaders and role models in their communities. Youth participate in community service events, learn to develop events and campaigns, and provide presentations to their peers helping prevent underage drinking and drug use. Community Development The establishment and maintenance of collaborative partnerships with community stakeholders through the SM W.O.R.K.S Coalition fostering environmental change to reduce underage alcohol and drug use in South Mountain. Take the Pledge to Not Provide Alcohol to Minors! 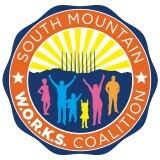 For more information, visit www.southmountainworks.org. SB&H is a proud member of the South Mountain W.O.R.K.S. Coalition; click link to find us on Facebook. To learn more about the prevention services at Southwest Behavioral and Health Services, please contact Thalia Williams, Director of Prevention Programs: 602-305-7126, ext. 3352.